Stay Afloat is a co-operative game of sinking pirate ships. Only you have the ability to keep your partner afloat; shoot life preservers at their ship to heal it. Collect as many coins as you can before sinking. Since having kids, I've thought a lot about how most games are competitive, and are primarily about destroying/killing/defeating things — or each other! 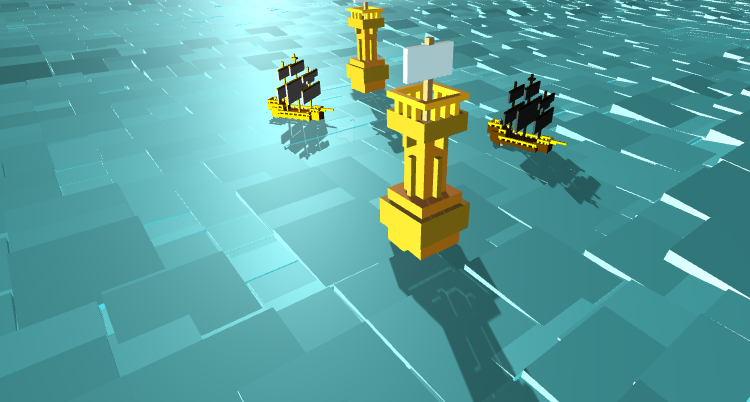 Stay Afloat is my attempt to turn that around, and still have a game that is interesting, challenging and fun. A co-operative game encourages players to interact and communicate with each other in ways that other games don't. The other piece of inspiration for this game was a stop-motion short film I saw years ago (I can't find it online any more). It was about two wind-up robots who had the task of getting themselves out of a sealed brick room. One would work for while, and before it would wind down completely, it would wind up its partner. Eventually one of them got greedy and tried to do too much, and didn't have enough energy to wind up the other, and so they both ended lifeless. It was a very striking picture of interdependence that has stayed with me, and shaped the core mechanic of this game. You require action from the other player to survive. WASD/Shift to move & shoot for P1, Arrows/Alt to move & shoot for P2. Your ships are constantly sinking; if one ship sinks, the game ends. Shoot your partner's ship to "heal" it. Pick up a coin to gain a point. Coins only stick around for 5 seconds, then reappear elsewhere. Sound Effects: Generously provided by Julian Beutel. Artwork: Made by me with ephtracy's MagicaVoxel.